Cell Forté® MAX3 / 120 Veg Caps - Nature's Way®. Take 2 capsules twice daily for maintenance. Best taken on an empty stomach. For maximum support, up to 10 capsules may be taken per day. Do not use if pregnant, nursing or attempting to become pregnant. If taking any medications, consult a healthcare professional before use. Saventaro® is a registered trademark of IMMODOL Pharmaka GmbH (Austria), and is made in the USA under license from IMMODOL. ‡SPINS IP-6 Ingredient Brands; 52 weeks ending 11-29-15; total U.S. X-WF. Why does the Cell Forté® MAX3 label not recommend to take on an empty stomach, as do all the other Cell Forté® product labels? We have reviewed our information and agree that the label recommendations for the Cell Forté® and the Cell Forté® MAX3 products are not consistent. Although we do not feel that the product is ineffective if taken with food, optimal benefits are attained when taken between meals. 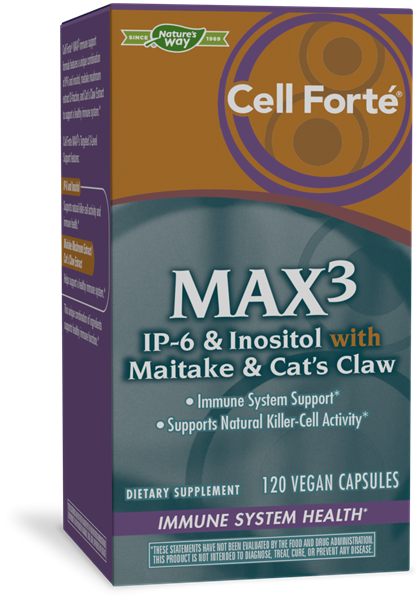 Therefore, the Cell Forté® MAX3 label will be updated to include the recommendation "Best taken on an empty stomach." We apologize for any confusion this may cause for customers.